I will always remember the summers between 1951 and 1957 as the times when I sat in front of my small black-and-white television set to watch the Brooklyn Dodgers play. Every Brooklyn kid was a fan and each had his or her favorite: Pee Wee Reese, Gil Hodges, Jackie Robinson, Roy Campanella, Carl Furillo, or Sandy Koufax. My favorite was the center fielder Duke Snider. When the Brooklyn Dodgers beat the hated New York Yankees in the seventh game of the 1955 World Series there was pandemonium all over Brooklyn. Only two years later that same exultation gave way to sadness and anger when the team left Ebbets Field to move to Los Angeles. Some say Brooklyn hasn’t been the same since then. Ebbets Field was part of our neighborhood. The first time I saw a game there, I remember my surprise and delight at seeing the actual green playing field. I remember having supper at the diner on Church Avenue and watching the door because it was rumored some of the players often ate there. And I recall that Mary Maher, one of my classmates, was a babysitter for Pee Wee Reese’s children. I remember walking with my friend Margie to find Gil Hodges’ house. He was just a regular neighborhood guy. No mansion, just a simple home like all the others on the block. Later on in college I heard the story of how a couple of guys from one of the Brooklyn College fraternities once slipped into Ebbets Field after hours and stole first base. I lost interest in baseball in 1957. 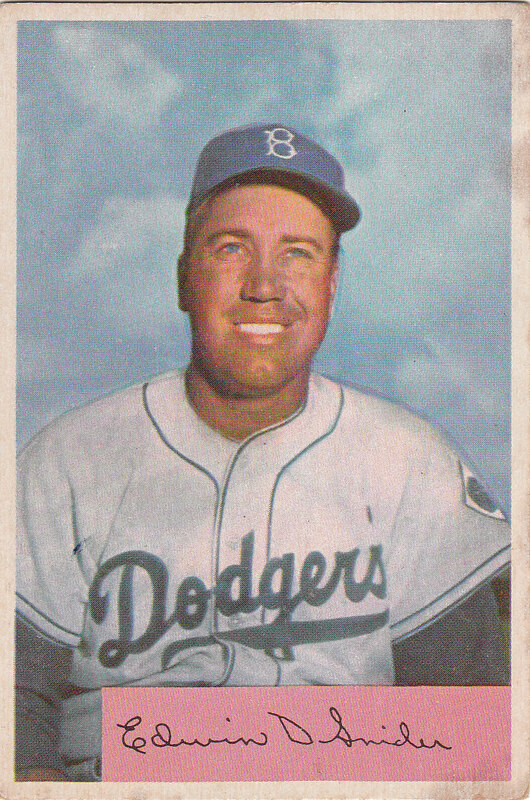 But I still have one baseball card from those days - with Duke Snider’s picture on it. I like the way you "heard" the story of how a couple of (unknown) guys from "one of the (unknown) ...fraternities" once slipped into Ebbets Field after hours and stole first base. Shouldn't that also say "allegedly" stole first base? I "heard" that it happened in 1955, after the Dodgers won the world series. My high school friend's father rented his walk-in apartment to Rube Walker who was Roy Campanella's back-up catcher on the Brooklyn Dodgers baseball team. Rube was very popular among the team members and MaryLou and I used to sit on her porch and watch the other players come to visit him. Johnny Podres and Sandy Koufax were among them. Rube would leave tickets for MaryLou and a guest for every home game. We would pick up the tickets at the players window. Then we sat behind home plate with all the wives. Once I sat next to Joan Hodges. We were sixteen and ecstatic. Rube would leave word as to where we should wait after the game,depending on which player was driving. At one time or another we were in the car with Carl Furillo, PeeWee Reese, the Duke, and many others. We sat quietly and listened to them joking with each other and we rode the streets of Brooklyn homeward bound. Yes, I remember 'The Boys of Summer'. As a youngster, I used to listen to baseball on the radio while I ironed. Even though I lived near Chicago, I always liked the Dodgers. Something went out of baseball after they moved -- although my grandfather in Los Angeles was eternally grateful. This brings back some nostalgia for me as well.